This post to my blog is one that both brings me joy but also saddens my heart. It's the 30th which means that it's time for the "Crafters of Faith" to share our projects based on the theme chosen by the hostess of the month. It brings joy because, while I've only been part of this group for a short time, I have come to love these ladies. But it saddens my heart because this is the last month for Crafters of Faith. I'll miss this group so much!!! Psalm 113:2 (KJV) "Blessed be the name of the LORD from this time forth and for evermore." With that, I ask you to create a card based on the blessing we receive from knowing how much was given for us! May we all be aware of the beautiful blessings we have and bestow to others. For your December card, create a card of your choice in color and design with the theme: Sprinkle an abundance of Blessings! He is Awesome and I'm so thankful for all He has done...and all He hasn't done. Yes, even the prayers that I've prayed that didn't get the answers I wanted...but the right answer in His perfect plan. 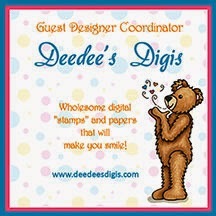 For my card I used a Bugaboo image that I love - Beautiful Blocks - Faith. To all my Craters of Faith sisters - It's been a pleasure spending the last couple months with you and you will continue to be in my prayers!!! God bless you today as we finish our last couple days of 2013 and head into 2014. Thank you for stopping by and spending a few moments with me. Zella, this card is absolutely beautiful! Such a reassuring quote and perfect image! I've enjoyed being in the Crafters of Faith blog group with you! OH Zella, your card is as refreshing as you are, my dear! What a bright burst of beauty in both color and meaning :) Your presence in the COF group has been a blessing and it will be fun to see you in our other groups, too! Blessings and here's to a wonderful 2014! Zella, what a lovely and fitting card for our challenge! Your thoughts shared with your posting are very special, too. Thank you for sharing them and the song! I hope that our paths cross on other threads on SCS. I will continue to visit your blog, because I love your work!